Manuel Conde (Manuel Urbano in real life) was born in Daet, Camarines Norte on October 9, 1915. He was an actor, director and producer. 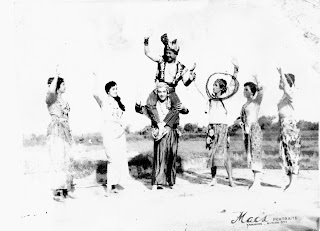 His first film was "Mahiwagang Biyolin" in 1935. Later, he signed a contract for LVN Pictures where he made almost three dozen films, both as an actor and director. 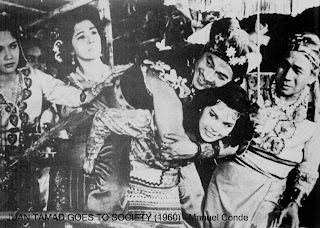 In 1947, he set up his own production outfit Manuel Conde Pictures (MC Pictures) where he made films we now considered classics such as the Juan Tamad series (Si Juan Tamad (1947), Si Juan Daldal (Anak ni Juan Tamad) (1948), Juan Tamad Goes to Congress (1959), Juan Tamad Goes to Society (1960), Si Juan Tamad At Juan Masipag sa Pulitikang Walang Hanggan (1963); Vende Cristo (1948), Prinsipe Paris (1949), Krus Na Kawayan (1956), Siete Infantes de Lara (1950) and its re-make in 1973, Molave (1961) and the internationally acclaimed Genghis Khan (1950). 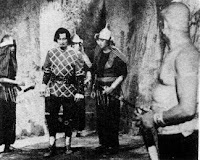 Genghis Khan was the first Filipino film to be acclaimed at an international film festival in Venice in 1952. His Juan Tamad Goes To Congress is considered the best Filipino satire ever filmed. 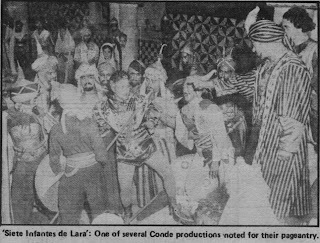 Some films intended for international release were planned by Conde but these were not pushed through because of some financial and production problems such as Saranggani, a film about the Ifugao rice terraces, a collaboration between James Agee as scriptwriter and Conde as the actor-director with United Artists as the distributor, the Rickshaw Boy and The Brown Rajah. 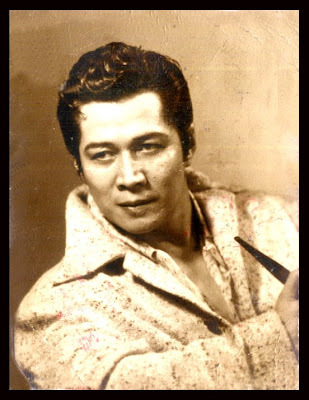 Conde’s eldest son, Jun Urbano (aka Manuel Conde, Jr.), followed his footsteps and became himself a film director, actor, producer and writer. He is better known as Mr. Shooli in a television comedy series Mongolian Barbecue. Manuel Conde died in 1985. He was honored posthumously in 2006 the Presidential Medal of Merit (for Films) by President Gloria Macapagal Arroyo for his contribution to culture and the arts. He was one of the recipients of that award together with visual artists Federico Alcuas, Oscar Zalameda and Mauro Malang Santos. From the words of Cecile Guidote-Alvarez, Executive Director the of National Commission on Culture and the Arts, “This is the President’s gesture of giving rightful honor to various artists who showcased Filipino excellence in the arts and cultural traditions in the international scene, underscoring the wealth of talent and heritage in our country”. In 2007, he was awarded posthumously the Lamberto Avellana Memorial Award by the Film Academy of the Philippines. In the mid-1950's, Manuel Conde wrote, directed and sometimes starred in several documentary films for the United States Information Service (USIS), one of which was "Give Us This Day". 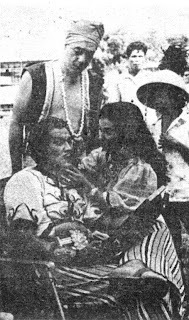 Before the shooting of "Si Juan Tamad"
LONG BEFORE Lino Brocka and Mike de Leon made waves in the Cannes Film Festival, Manuel Urbano, Manuel Conde to movie fans, had created an international sensation in the 1952 Venice Film Festival with Genghis Khan, a photoplay he produced, directed and starred in. 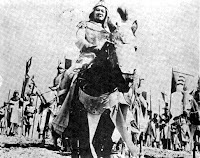 Genghis Khan was the very first Filipino film entered in an international film festival. The Saturday Review of Literature, in its preview of this movie, observed: "Primitive in most respects -- including acting, make-up, sound and processing -- it still has moments of curiously impressive power and intensity, a delight in the sheer production of a film." There are those who contend that if Genghis Khan were the only film made by Conde, his position in the entertainment world, both here and abroad, would be secure. Genghis Khan, filmed in 1949, has been dubbed in 17 languages, among them English, Chinese, Vietnamese, French, Italian, Spanish, Thai, German,Swiss and Japanese. Reviewed favorably by Time and other international publications, it is still being shown in art theaters all over the world. Verily, Conde is ripe for a National Artist award in the field of arts and entertainment. In 1981, his many achievements earned him a place, along with seven others, in the Hall of Fame for movie directors. He had produced, directed, and starred in several productions noted for their pageantry, such as Siete Infantes de Lara, Prinsipe Paris, Juan Tamad and Juan Daldal. He was the leading man and also the director of Sigfredo and Apat na Alas, Lebran and LVN productions, respectively. He helped direct the pre-war Ibong Adarna, but was in full control of its post-war version. All the above-mentioned films involved casts of hundreds. 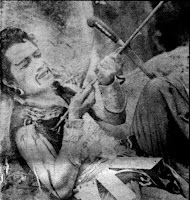 Conde's grandest spectacle, however, was Krus na Kawayan, which he made in the early fifties. One of the biggest and most expensive pictures done in the Far East, it involved a cast of 1,700 and its two versions cost over P800,000 (a fortune in those days). Its Vietnamese counterpart was entitled Chung Toi Muon (Le Us Live). The main troupe alone numbered 102 while the general cast included real refugees from North Vietnam (the movie was filmed in Vietnam). It is still being shown in international art theaters. Today, however, Conde is best known for his Juan Tamad photoplays, which lampooned the indolence of the Filipinos, a characteristic which Jose Rizal bewailed in his writings. Before the war, there were only two Juan Tamad films. In 1959, Conde transported the legendary Lazy John to modern times. The movie entitled Juan Tamad Goes to Congress, was a satirical commentary on Philippine political life and mores and took potshots at influence peddlers, grafters and congressional shenanigans. It was, however, set in pre-Hispanic times as far as musical scoring and costumes were concerned. Otherwise, it was full of modernisms: racy and jazzed-up dialogue, references to "press conferences" and "influence peddlers"; such practices among modern politicos as kissing babies and jumping over fences and canals; and a streamlined, fish-tailed carabao-drawn sled a la Cadillac with the familiar No. 8 plate of the pre-martial law congressmen. Later Conde made Juan Tamad Goes to Society which made fun of social climbers and the predilection of Filipinos (acquired from the Americans) of keeping up with the Joneses. Explaining the rationale behind his Juan Tamad films, Conde says: "The funniest things in life, indeed, are not well-rehearsed jokes but real-life faux pas, like the fumblings and bumblings of congressmen and the inordinate desire of society climbers for meaningless achievements." "Juan, like many of us, is lazy only physically," says Conde. "His brain works endlessly, thinking up schemes and contraptions to lessen his daily onus. He has a fatalistic but nonetheless cockeyed philosophy: Everything in life is predestined. Ergo, why should I work to attain what is already mine by destiny. This carefree outlook impels this lovable folklore character to wait under the guava tree for the fruits to fall into his mouth." Conceived as early as 1957 by Pedro A. Venida, then a Nacionalista congressman from Camarines Norte, Juan Tamad Goes to Congress was realized through the combined talents of rugged individualists like Carlos V. (Botong) Francisco, the country's top muralist, who was production manager and setting director; musical director Ariston Avelino; scriptwriter Jess Banguis, and of course, Conde. While the picture was being made, this writer voiced the fear that a considerable portion of the film might end up in the scissors department of the Board of Review for Moving Pictures because of its controversial nature. Conde, who became a politician himself (he ran for Congress in Manila in 1965 but lost), declared with asperity: "Why? The main purpose of the picture is to entertain. There's nothing immoral in this film. Neither does it violate any censorship law." Fortunately, the movie was passed without a single cut. MANUEL CONDE is living proof that the Horatio Alger era is far from over. A product of the school of hard knocks, he had worked as a pier hand, lumber yard helper, seller of sundries, fruit vendor, road worker, mine laborer, cochero, taxi driver, movie extra and stuntman before becoming a star, producer and director of lavish spectacles. The son of the late Dionisio Urbano, an Italian mestizo ("That's why I'm crazy about pizza, ravioli, spaghetti and other Italian dishes," the suave and mustachioed Conde says), and Lucia Conde, Manoling was born in Daet, Camarines Norte, on October 10, 1915, the youngest among three boys and two girls. "There are three things I always remember about my childhood," he reminisces. "Firstly, we were orphaned when I was just a tot. Secondly, we never knew any luxury and we were working all the time. Thirdly, I was obsessed with the ambition of becoming an actor. I used to wear the clothes of my elder brothers, put on a charcoal-made mustache, and march in front of the mirror grimacing and practising all kinds of faces to register various emotions from anger to zest." He was only six years old and a first grader when he appeared in his first starring role as Old Black Joe in a school play at Daet Elementary. "I was blackened all over with charcoal and wore a beard made of abaca while I sang Old Black Joe," he remembers. 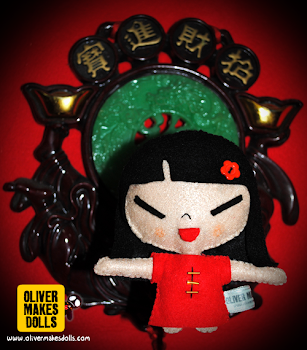 "I appeared in several school plays and wrote and directed my own dramas in high school. Even then, I was already a certified ham." Once, when he was a junior in high school, he auditioned with several teachers for a part in a play which had seven principal characters. He was surprised to learn later that he had qualified for all the roles, except that of the leading lady. "I started selling sundries when I was only seven," he says. "After finishing high school, I came to Manila and worked my way through college by doing all sorts of jobs -- from rig driver to pier hand." While studying at Adamson University, Conde skipped classes just to hang around the old Filippine Films studio in Sta. Ana. He was then hired as a stuntman with a salary of 70 centavos a day, regardless of the number of dangerous scenes he had to perform. "I got bored being a movie daredevil because I worked only when there were dangerous scenes to perform," he says. In 1935, he signed a six-month contract with George Harris, co-owner of Filippine Films, agreeing to work without pay just to be able to acquire experience. "People thought I was the stool pigeon and spy of Harris because they knew I had no salary yet I reported for work in tailor-made suits and used to give glow-outs for the extras," Conde relates. "They didn't know that I was able to save quite a bundle form my previous jobs, which money was augmented by the sums sent to me monthly by my sisters to help me through college." The actors in Filippine Films assigned the hardest tasks to Conde, such as sweeping the entire studio lot, cleaning the smelly chemical tanks and doing carpentry. When they could not discourage him from quitting, they shifted him to the script department and again made him a stuntman. One day, however, he was turned away at the studio gate because somebody said he was a pickpocket "since I had no visible means of support and yet was living in style." Nevertheless in 1936, he finished geological engineering at Adamson and that same year passed the board of exams. He was immediately hired as a junior geologist engineer by Placer Mining Company in Paracale, Camarines Norte where he had worked as a mere laborer years before. Scheduled to leave for Java for a tungsten prospector for the company in 1938, he missed his boat because he had stayed up the night before drinking with some friends. This turned out to be a blessing in disguise as Conde saw director Carlos Vander Tolosa, an old crony at Filippine Films, who told him he was joining a new movie outfit known as LVN Pictures. Tolosa invited Conde to join the fledging company. Conde became an assistant director at LVN. After doing a good job of Giliw Ko and Hali, he was made a full-fledged director in his third film, Sawing Gantimpala, which was based on a story written by the late Mrs. Aurora Aragon Quezon, who was one of the original LVN incorporators. All told, Conde has directed more than 60 photoplays. 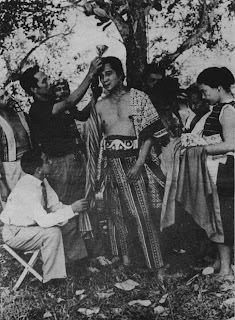 Among his pre-war films were Maginoong Takas, Ararong Ginto, Villa Hermosa, Prinsipe Tenoso and Binatilyo. 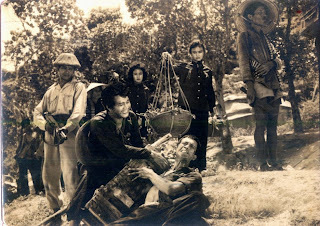 Of his early post-war directorial assignment, Ikaw Kasi was the top box-office hit in 1955. 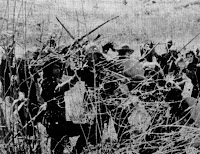 "While shooting Prinsipe Tenoso, the war broke out," Conde recalls. "During the Japanese Occupation, the filming of the picture was continued but the Japanese wanted to inject propaganda into it. I suggested many silly things such as showing a can of milk with the words "Made in Japan" printed on the label. The exasperated Nippon censor finally left me to my own devices." In 1943, Conde joined Marking's Fil-American guerrillas and rose to the rank of major. He was among those who liberated the American prisoners of war in Los Banos in 1944. He also took part in the Battle of Bay, Laguna, where the Japanese 13th Regiment incurred heavy losses. 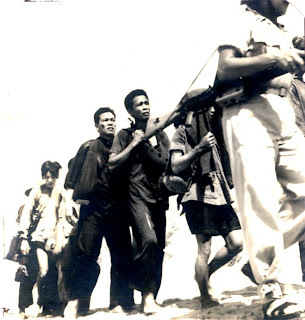 In 1945, while still in the Armed Forces of the Philippines as a regular major, he directed Orasang Ginto, his first post-war picture and the first movie to be made after Liberation. He was almost court-martialed when he ordered his entire battalion to take part in the battle sequences of the film. "Talk of realism in war movies," he says with a grin. 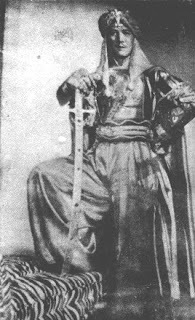 Discharged honorably in 1946, he produced his own pictures, such as Juan Daldal, Juan Tamad, Vende Kristo, Prinsipe Paris, Siete Infantes de Lara and Genghis Khan. In between starring, producing and directing his own films, he directed lavish costume and action pictures for other studios. At the 1952 Venice Film Festival, he had one stock answer for anyone who asked him about Philippine movies: "Genghis Khan, gentlemen, is just a small and insignificant picture compared to the films produced by our bigger and better-equipped studios in the Philippines." His magnanimity is one aspect of Conde's personality that is not known to those who accused him of trying to hog that festival. Conde speaks several dialects fluently, including the three Bicol tongues (Naga, Albay and Sorsogon), Cebuano, Ilonggo, Waray, Pampango and Pilipino, in addition to English and Spanish. He understands Ilocano and Pangasinense and speaks a smattering of both dialects. A happily married man with several children, Conde still occasionally appears in movies and TV dramas. "In this business," he says, "you never stop acting. Come to think of it, life is one continuous acting chore. But what I want to do in the near future is another Juan Tamad movie about present-day mores and about the New Filipino, whatever that means."